Primobol 100 - this injectable steroid British Dragon, developed by the active ingredient enanthate methenolone substance. The drug has a reduced androgenic activity in anabolic effect is almost identical to that of nandrolone and testosterone. The main effect of the injections is "dry" and "consolidation" to gain muscle mass. It is important to remember that the drug does not provide a significant body weight, but gradually increases energy rates. Thai current drug substance was synthesized by German scientists in the early 60s of the twentieth century. Unlike most of the other things that were developed specifically for use in sporting activities, so that the precursors of the product described quickly gained popularity among different sports - bodybuilding to martial arts. Methenolone enanthate molecule - is mutated or modified steroid dihydrotestosterone, do not expose flavoring. This explains the fact that the side effects of using BD Primobol 100 and its analogs are almost absent. The only exceptions are cases of a drug overdose and individual susceptibility of the organism, in such situations, even a "soft" drug relatively can have side effects. Primobol 100 properties allow rightfully find it easy to steroids, which is suitable for use by experienced and beginners, and even women athletes. Moreover, almost no steroid suppresses testosterone production. Action steroids appreciated by the representatives of many sports. Bodybuilders use during the drying period and maintaining the shape/consolidate the results in the offseason. It is ideal for novice athletes who have no experience of steroids to go heavier counterparts. 100 Primobol dose should be selected based on the general state of the host body and, if possible, according to experienced athletes, who already had experience with the drug. Therefore, before starting the injection, please visit our Resource Forum, which will help you create an individual course. Dosage Primobol 100 (British Dragon) involves the introduction of 200-400 mg per week for men and 50-100 mg - for women. The launch of the drug over the specified dosages threatens the occurrence of side effects, which are expressed in the form of lower testosterone levels, increase aggression and irritability, increased liver enzymes, and insomnia. At the same time, the steroid is usually not causing alopecia, acne or appearance of hair growth in women. 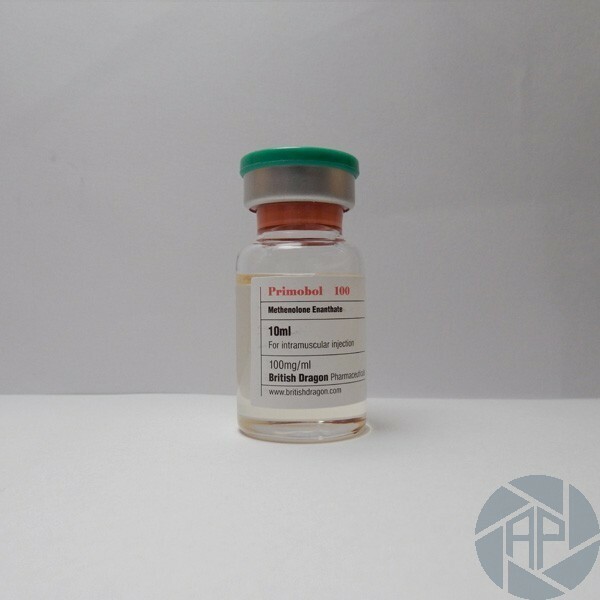 Today, this injectable anabolic androgen, and it will not turn on the counter, so athletes have to find other ways to buy. Be careful with the purchase, because a defective product can have not only the desired effect but also damage health. Instructions for receiving the drug you can find on our forum. It is also possible not only to find information using a steroid but also get advice from our consultants and moderators of the Forum. Course Primobol 100 is long enough and lasts up to 8 weeks, due to the relatively slow in switching operation of the active ingredient. However, after methenolone enanthate injection remains active in the athlete's body till 14 days, allowing infrequent administration of the preparation (1-2 receive a week). Experienced to deviate from this line of athletes steroids are not recommended for reduction or increase in the time of receiving the injections does not give the desired effect, and in some cases can cause the occurrence of side effects. The use of BD 100 Primobol possible either alone or in combination with other steroids that will achieve a synergistic effect, i.e., when co-administration of two or more drugs provides better results than a separate application. If you do not know how to carry out a course of better reception in conjunction with other steroids, feel free to follow the advice of the most experienced athletes. Therefore, many say that one of the most optimal combinations is the combined use with injectable stanozolol. To adjust the masses quickly we may recommend the use of methenolone enanthate testosterone (Sustanon), and muscle growth is expressed - with Nandrolone or Trenbolone Oxymetholone. No need to explain that before you start using the product, it is necessary to examine the responses of 100 British Dragon Primobol, leaving athletes with steroids experience premium. In this sense, it would be an indispensable forum in our shop, where each review by experienced athletes and veterans working in the sports sector. Most athletes who have used injections of the same opinion. Comments Primobol 100 British Dragon say long the active ingredient found in the tests (up to 6 months), so not suited for a reception before the competition, but can be used effectively in only sports fans out of season or to maintain physical. Primobol 100 comments confirm the fact that the steroid is safe for the host's body and causes no side effects subject of recommendations. Experienced athletes are not advised to exceed the permissible dose. Many are encouraged to take medication after therapy post-cycle course (tamoxifen, etc.) that allows you to achieve maximum performance and successfully overcome the recovery phase. Among other statements, it can be identified as entering pain medication. However, this can be avoided by heating the drug before injection. The sufficiently high cost of steroids according to the athletes are justified because of real effect.